The nooriously long waits at Miami International Airport’s immigration control areas have eased partly because of technological improvements like automated passport swipe kiosks and mobile phone apps that enable some passengers to breeze through immigration, a senior U.S. official said at MIA Friday. “Even as travel volumes continue to rise, wait times at Miami International Airport are down approximately 16 percent since their peak in fiscal year 2013,” said Alejandro Mayorkas, the Deputy Secretary of Homeland Security. Emilio González, director of the Miami-Dade Aviation Department, which runs MIA, confirmed Mayorka’s statements that immigration lines at MIA have grown shorter. The fact that Homeland Security and MIA officials agree that passport control lines are shorter than they used to be is a departure from the concerns that Gonzalez and other airport officials expressed publicly. In March last year, for example, Gonzalez flew to Washington to plead with federal authorities to increase the number of passport control officers at MIA because wait times at immigration lines were too long. Now, Gonzalez said Friday, MIA, Homeland Security and other “private partners” are working in unison to continue improving the passport control experience. “I used to receive complaints all the time,” said Gonzalez. “Now I can’t remember the last time I received a complaint. In March 2014, Gonzalez said before leaving for Washington that in one case a group of travelers had to wait 2 ½ hours in the immigration line before being admitted. Mayorkas and Gonzalez attributed the improvement in part to the new machines that allow travelers to swipe their documents and in many cases skip the passport control booth. Mayorkas cited three examples of passport control automation that have greatly contributed to ease the passenger crush . These are the so-called global entry system kiosks for pre-approved passengers; automated passport control self-service kiosks for U.S., Canadian and visa waiver travelers; and mobile passport control phone apps. “Currently, nearly 20 opercent of all inbound travelers to Miami International Airport use the automated passport control kiosks,” said Mayorkas. The mobile passport application, which is currently still in pilot phase, allows travelers to complete a customs declaration, submit passport information and upload a photograph prior to inspection. Once information is submitted, the app generates an electronic receipt sent to the traveler’s mobile device with instructions. Mobile Boarding Pass can be used to pass the boarder and security control if starting a flight from Kiev. So far only printed boarding pass was accepted. Mobile Boarding Pass can be obtained while checking in via internet. Web check-in for all Estonian Air flights is available 36 hours and until 45 minutes before scheduled departure. Passengers starting their trip from Moscow and St Petersburg should note that they still must present printed boarding pass at the local boarder and security control. Passengers who have checked in but have no possibility to print out the boarding pass, can print it free of charge at the check-in kiosk or request it from the check-in counter or baggage drop-off desk at the airport. Automated check-in is the most convenient way to check in. For automated check-in passengers have to enter their mobile phone number during booking process. Phone number can also be added later to the booking via My booking on Estonian Air website. Passengers will receive automatic check-in confirmation with the link to the boarding pass on their mobile phone at 7 p.m. in the previous evening if their flight departs between 00:01-18:59, or at 8 a.m. if their flight departs between 19:00-23:59. In Tallinn and Scandinavian destinations passengers can also check in free of charge at check-in kiosk at the airport. Web, automated and check-in at the kiosk can be used with both registered and hand baggage. Passengers with hand baggage only can proceed straight to the security check at the airport; registered baggage must be taken to the baggage drop-off counter on the day of departure. For more information about check-in please visit Estonian Air webpagehttp://estonianair.ee/en/info/traveling/check-in/. Low-cost airline SpiceJet, which has been facing a major cash crunch for quite some time, has cancelled over 1,800 flights across the country for the current month, signaling mounting troubles for the budget airline. The carrier, which is part of Kalanithi Maran-led Sun Group, has cancelled a total of 1,861 flights, a few to Kathmandu in Nepal and all others connecting domestic cities, till December 31, SpiceJet said in an update on its website. These included 81 flights scheduled for Monday. The large-scale flight cancellations came at a time when the aviation regulator DGCA was considering issuing a show-cause notice to the airline for defying its directives regarding advance bookings. DGCA has asked the airline to stop taking bookings by tomorrow of more than one month in advance. Besides, Airports Authority of India (AAI) is said to be considering putting SpiceJet on cash-and-carry mode soon if it does not furnish a bank guarantee against its dues to the airport operator, which stand at around Rs 200 crore. Concerned over the deteriorating condition of SpiceJet and large-scale flight cancellations, DGCA had on Friday also withdrawn 186 of its slots and asked it to clear salary dues of all its employees within the coming 10 days. 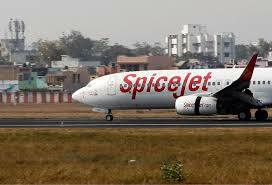 SpiceJet stock has fallen by over 28 per cent in last 5 trading sessions. Shares of SpiceJet, which tumbled 13 per cent in early trade on Monday amid a flurry of negative news including fund drought and large-scale flight cancellations, closed with a loss of 4.39 per cent at Rs 15.25 apiece. Union Civil aviation minister Ashok Gajapathi Raju also last week raised serious concern over the financial health of the domestic airline.